Deepen your sense of the past at sights like Birthplace of Jean Sibelius and Finlayson Church. You'll visit kid-friendly attractions like Rauhaniemi Beach and Ahvenisto Activity Park. Go for a jaunt from Tampere to Haemeenlinna to see Museo Militaria about 1h 20 min away. see Sarkanniemi Theme Park. There's much more to do: examine the collection at The Finnish Labour Museum Werstas, take in the spiritual surroundings of Tampere Cathedral, pause for some serene contemplation at Church of St. Alexander Nevsky and St. Nicholas, and get engrossed in the history at Milavida Museo. To see reviews, other places to visit, where to stay, and other tourist information, you can read our Tampere trip itinerary builder site . If you are flying in from Argentina, the closest major airport is Tampere-Pirkkala Airport. In October, plan for daily highs up to 8°C, and evening lows to 0°C. 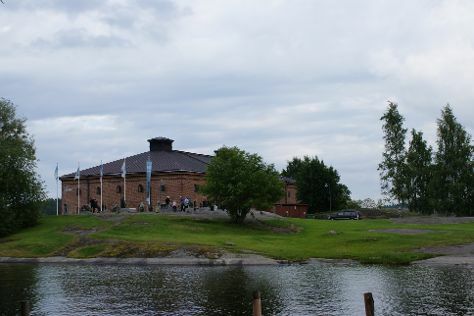 Wrap up your sightseeing on the 26th (Mon) early enough to take a train to Jyvaskyla. Jyväskylä is a city and municipality in Finland and in the western part of the Finnish Lakeland. Kick off your visit on the 27th (Tue): test your problem-solving skills at popular escape rooms, look for gifts at Punnitse & Saasta, examine the collection at The Craft Museum of Finland, then learn more about the world around you at Natural History Museum of Central Finland, and finally view the masterpieces at Kuokkalan kartano. To find reviews, other places to visit, more things to do, and more tourist information, refer to the Jyvaskyla trip itinerary maker . You can take a train from Tampere to Jyvaskyla in 2 hours. Another option is to drive. October in Jyvaskyla sees daily highs of 7°C and lows of 0°C at night. Wrap up your sightseeing on the 27th (Tue) to allow time to take a train to Kuopio. Kuopio is a city and a municipality located in the region of Northern Savonia, Finland. On the 28th (Wed), explore the world behind art at Kuopio Art Museum, take in the architecture and atmosphere at St. Nikolaos Cathedral, see the interesting displays at Kuopion Korttelimuseo, then examine the collection at Kulttuurihistoriallinen Museo, and finally take in the waterfront at Kuopio Harbor. On the next day, examine the collection at RIISA - Orthodox Church Museum of Finland, then explore the activities along Valkeisenlampi, then take in the architecture and atmosphere at Lutheran Cathedral, and finally test your problem-solving skills at popular escape rooms. To find traveler tips and tourist information, read our Kuopio online trip itinerary planner . Traveling by train from Jyvaskyla to Kuopio takes 2 hours. Alternatively, you can take a bus; or drive. In October in Kuopio, expect temperatures between 7°C during the day and 1°C at night. Finish your sightseeing early on the 29th (Thu) to allow enough time to drive to Savonlinna. Kick off your visit on the 30th (Fri): take in the architecture and atmosphere at Savonlinna Cathedral, look for gifts at Taito Shop Savonlinna, pick up some local products at Savonlinna Market Square, take in the architecture and atmosphere at Pikkukirkko, then explore the historical opulence of Olavinlinna Castle, and finally examine the collection at Savonlinna Provincial Museum. For other places to visit, reviews, photos, and other tourist information, use the Savonlinna journey builder . Getting from Kuopio to Savonlinna by car takes about 2.5 hours. Other options: do a combination of train and bus; or take a bus. In October, daily temperatures in Savonlinna can reach 7°C, while at night they dip to 1°C. Wrap up your sightseeing on the 30th (Fri) early enough to drive to Lappeenranta. Kick off your visit on the 31st (Sat): take in the architecture and atmosphere at Lauritsala Church, examine the collection at Wolkoff House Museum, pause for some serene contemplation at Church of the Intercession of the Mother of God, then admire the masterpieces at Lappeenrannan taidemuseo, and finally contemplate in the serene atmosphere at Lappeen Marian kirkko. To find traveler tips, reviews, maps, and tourist information, go to the Lappeenranta trip planner. You can drive from Savonlinna to Lappeenranta in 2.5 hours. Other options are to take a train; or take a bus. In October, daytime highs in Lappeenranta are 8°C, while nighttime lows are 1°C. Finish up your sightseeing early on the 31st (Sat) so you can go by car back home.